Tell us a little bit about this project! What were the clients looking for? This project started out as a kitchen remodel. Our client is an independent, high-powered VP who loves wine, cooking, and entertaining. She was looking for a functional and fresh design more reflective of her style. 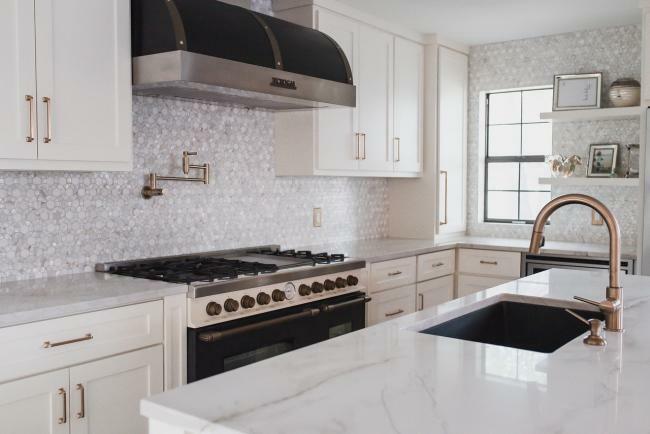 Her home is a red brick, two-story home built in 1982 – I’ll pause a moment to let you envision the dark, dreary, and closed-in tight space that was her former kitchen. I immediately knew we needed to remove the wall between her existing dining room and kitchen to enlarge and open-up the space. The dated bay windows, awkward corner kitchen sink, and varying header/ceiling heights all presented some unique design challenges. 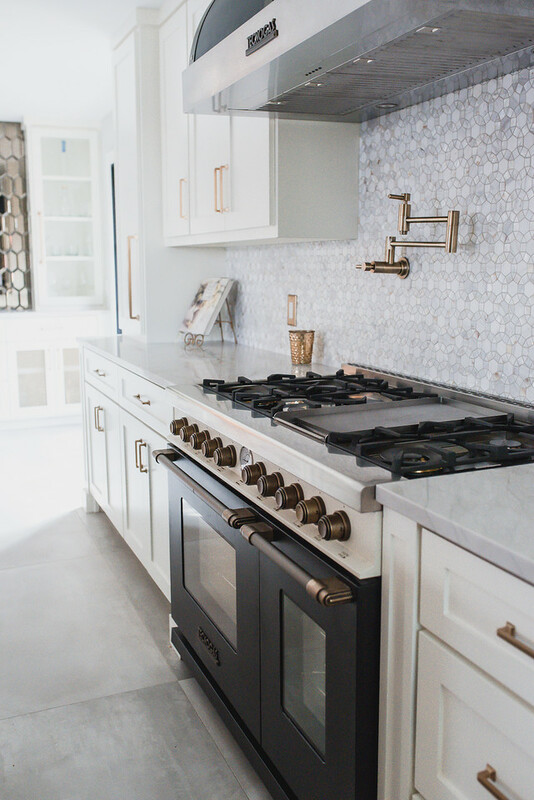 When the design of the kitchen started to take shape, we quickly realized we would need to rebuild the entire first floor since the kitchen was turning in to something special. Our client was a dream to work with, as she constantly travels to Italy or Tokyo for work. Due to her hectic schedule and frequent trips, she entrusted me with all of the design choices. Fun! Where did you find the inspiration for this kitchen design? The inspiration for this kitchen design was hatched well before we started this project. I stumbled across an Instagram photo of the SUPERIORE DECO Series 48” gas range in dual color with matte black and bronze and aesthetically, it was love at first sight. I was obsessed and knew I had to use it in a future project and this client’s timeframe, budget, and project scope was a perfect fit. As I learned more about the functionality and quality of the range, it became the inspiration and the MVP (Most Valuable Part) of the entire project. How did you hear about SUPERIORE and why did you decide to include one of our ranges in the design? My first introduction to the SUPERIORE brand was on Instagram. I then did a quick search, found a local dealer (Elite Appliance) here in Dallas and had the opportunity to marvel at the floor models. Cosmetically, the range has several differentiators you just don’t see with other appliance brands. The bespoke color combinations and attention to detail made this buying decision an easy one. What are your favorite features of the SUPERIORE DECO range? My favorite features of the SUPERIORE DECO range include ease of use – whether you are a novice cook or professional chef, it makes cooking fun and easy. Our client loves the flexibility of the range. She can host large parties because the six burners and two ovens allow her to cook and feed dozens of partygoers at the same time. For the times she is recovering at home from her world travels, the range is also great for cooking up a pasta dish for one. 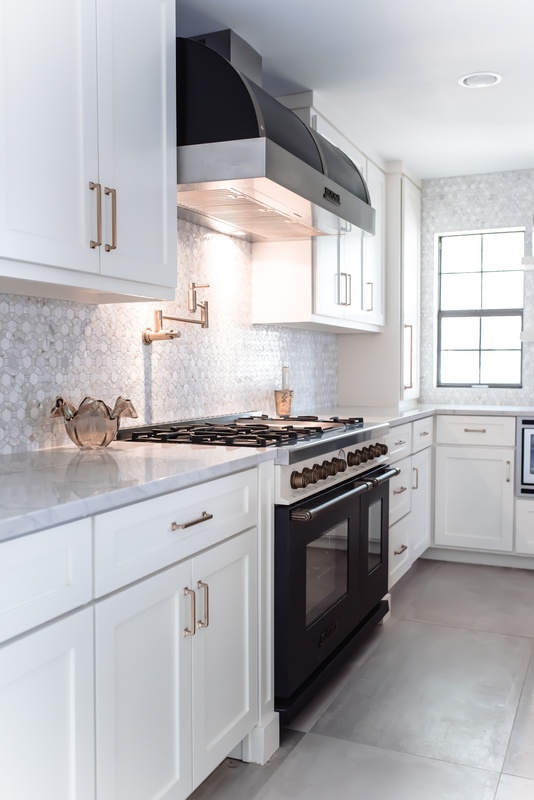 As the designer in this project, what is your favorite part of this kitchen design and why? As the designer on this project, my favorite part of the kitchen design is the entire kitchen! Can I say that? Ha! The modern sophistication of the DECO range demands attention. The 48” range was intentionally placed on the main kitchen wall that is visible from almost every corner of the ground floor. Upon entering the home, the range is the focal point of the entire kitchen – whether you enter from the front or back! Our client works in the jewelry industry and we often commented on how the SUPERIORE DECO range was as beautiful as some of the high-end jewelry she sells. 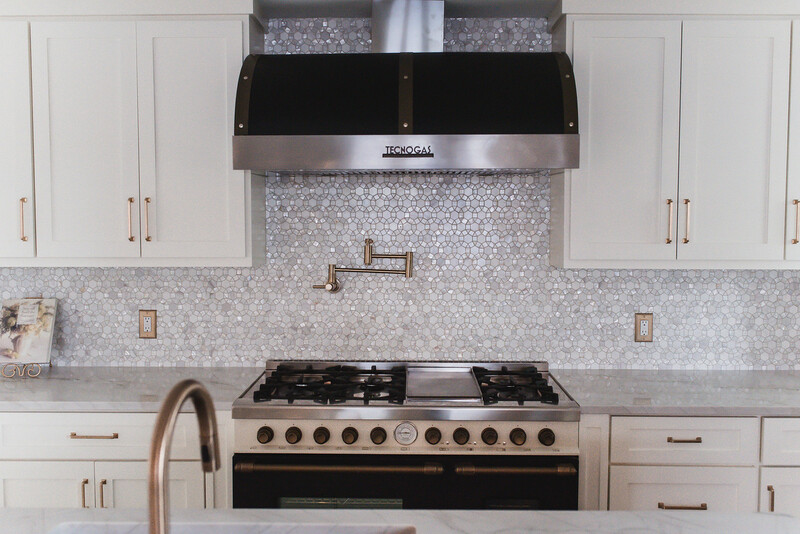 What do you consider the most essential element to designing a great kitchen? The most essential element to designing a great kitchen starts with listening to the wants and needs of the client. As a designer, we must take those specific requests and marry them with the second most essential element to kitchen design – functionality. Today’s kitchen is the heartbeat of the home, no longer just a place where food is prepared. Everyone congregates in the kitchen, so it should be open, bright, functional, and organized. The configuration should allow the homeowner(s), family, and friends to huddle around, but also provide a smooth flow for ingress and egress into the space. Any welcoming and comfortable kitchen will be an epicenter, so the design needs to make a statement.